Who's ready for another leg of The SM Store's 3 Day Sale Tweet Day Sale? If you are, like, share & read on! 3. Attach promo poster when you tweet. 4. Ten (10) Winners of P5,000 each will be announced on January 30, 2014, 12:00 noon. 5. Claiming of Shopping Certificates will be on January 31, 10:00am at The SM North Edsa Prestige Lounge. 6. Validity of Shopping Certificates is from Jan 31 to Feb 2, 2014 only. 7. Shopping Certificates are valid only at the SM Store North Edsa. 8. 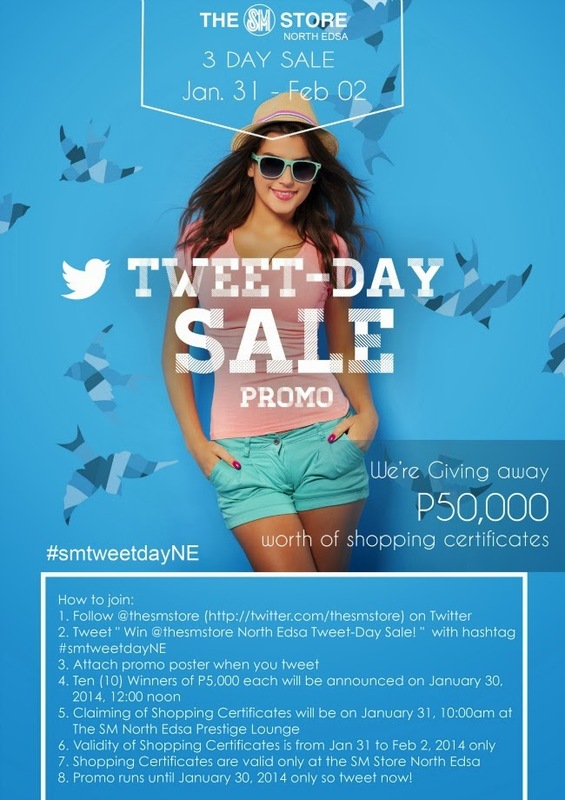 Promo runs until January 30, 2014 only so tweet now!